"A Grand Vaudeville Performance by the artistic and wonderful troupe of Mannikins, each being a surprise of mechanical skill and ingenuity. A brilliant parade of clever Fantoccini, followed by a comic pantomime, concluding with a grand transformation scene, comprising wonderful changes and effects." Rozella was a well known and popular marionette showman at the end of the 19th Century and earlier parts of the 20th Century. He was also an excellent writer on theatrical technicalities and under the name of "Rose" produced several books on this subject. He wrote a series of articles for the "Boys Own Paper" on "How to make and operate a Marionette Show", which appeared in the volume for 1896 - 1897. 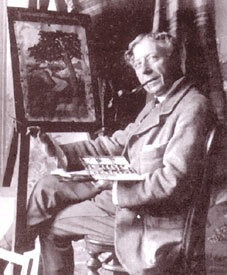 He was also an accomplished artist and illustrated his books and articles with some fine drawings all of which show a complete understanding of his subject as well as skill with a drawing pen. Through the good offices of Mr Arthur Elsbury, Rozella's son, Waldo Lanchester and Harry Whanslaw of The London Marionette Theatre were able to purchase the complete Rozella fit-up, scenery and marionettes. They were unable to use the theatre, which Whanslaw described as "charmingly Victorian" and his great regret was that a photo of it was never taken when it was fitted up. 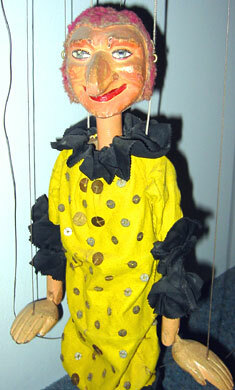 The Rozella Marionette Theatre did most of its shows in the days before electric lighting was adapted to portable stages. The dim light which illuminated Rozella's marionettes came from a series of triangular shaped tin candlesticks with reflectors and small oil lamps. His musical accompaniment came from a musical box of the type known as a Polyphone. It used a collection of metal discs which were each labelled with the name of a different tune. However, Whanslaw wrote that all the tunes sounded very much alike. The puppets were very well costumed. There were the usual Fantoccini puppets, Stilt Walker, Chinese Bell Dancers, Policemen, Clown, Pantaloon, Harlequin, Donkey and Cart. There was also a figure which represented 'Shock-headed Peter and a cow. Rozella christened his show 'The Bijou Marionette Theatre' and on his handbill he described it as "A Grand Vaudeville Performance by the artistic and wonderful troupe of Mannikins, each performer being a surprise of mechanical skill and ingenuity, a brilliant parade of clever Fantoccini, followed by a laughter-provoking, innocent, enjoyable and interesting comic pantomime, concluding with a grand transformation scene entitled The Home of the Fairies in the Cavern of Jewels, comprising wonderful changes and effects." For nine consecutive years, Rozella performed this show at the Mansion House, London, on the occasions of the Lord and Lady Mayoress' Juvenile Fancy Ball. Rozella's name lived on, when his puppets became part of the London Marionette Theatre (in approximately 1930) and subsequently the Lanchester Marionettes (1940s until Waldo Lanchester retired). 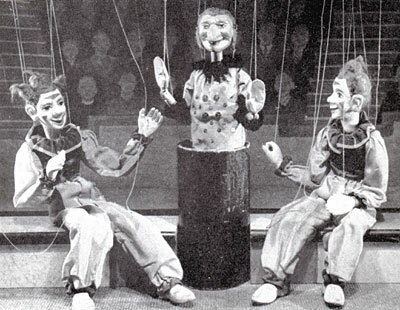 The puppets were re-strung and adapted to Lanchester's own way of manipulation.